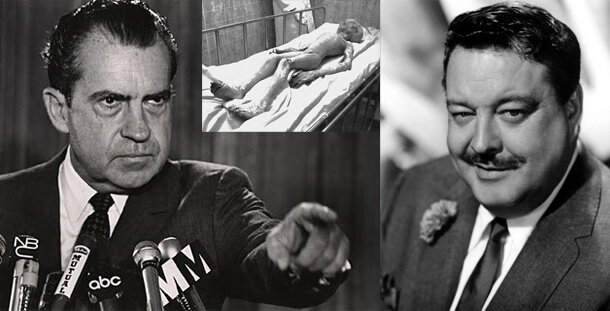 I’ve been reading up a lot on Jackie Gleason recently, and something which particularly caught my eye is that not only was Jackie Gleason a big believer in the supernatural and in UFO’s, he claims that four Presidents told him that UFO’s are real, and that Richard Nixon actually showed him the wreckage of a UFO and the frozen bodies of aliens! His story seems to even be corroborated by the head of the Strategic Air Force Command — though it is possible he may have just been joking. When he found he couldn’t drink all his money, he started spending small fortunes on explorations of occultism and UFOs, two fields that had long fascinated him. His recently acquired insomnia allowed him to devour hundreds of books speculating about strange, unexplained phenomena and aliens plotting amongst humanity. He loved to argue the subjects and during one knock-down drag-out debate with a newspaper columnist at Toots Shor’s, he received an unexpected affirmation of his beliefs. Gleason assured the columnist that UFOs had been seen by both sides during World War II, and that four Presidents had told him they were real. The columnist scoffed until General R. O’Donnell, the head of the Strategic Air Force Command, overheard the two arguing, walked up, whispered, ‘Jackie’s right,” then walked away. Gleason’s second wife, Beverly McKittrick, claimed Jackie was given an even grander affirmation by President Richard Nixon, Jackie’s frequent golfing partner. According to her, Nixon ditched his Secret Service entourage, picked up Jackie and drove him to a heavily guarded compound at the Homestead Air Force Base in Florida. There he showed Jackie the wreckage of a crashed alien spaceship and the frozen bodies of dead extraterrestrials. Beverly claimed the event heavily traumatized Jackie-he couldn’t sleep for weeks and had to double his usual intake of alcohol just to get back to normal. The accuracy of the story has always been questioned, because Gleason never spoke openly about the event. The original person telling the Gleason/alien body story was Beverly Gleason, Gleason’s second wife from 1970-1974. Now after many years of silence Mrs. Gleason speaks out again to confirm the story she first told many years ago. The latest interview is done by Kenny Young. This morning I spoke by telephone with Beverly Gleason McKittrick, an ex-wife of the late comedian Jackie Gleason. I explained to her that I was interested in the progress of her book and if she could talk about Jackie Gleason’s claim of seeing alien bodies at Homestead Air Force Base in Florida. She said that the book never came out as she had ‘stopped writing’ of it. She said she was ‘glad to get out of it’ as Jackie Gleason did not seem pleased with her quoting him on the aliens in Florida. She said that there was not much additional to tell as the whole story regarding Jackie Gleason and the aliens, as far as she knew, had already been printed anyway. Beverly went on to explain how Jackie came to tell her of his experience. “Jackie had been out very late one night I did not know who he was with,” She said. “He told me where he was that same evening, he said he had been in South Florida with President Nixon to see some dead aliens there and I believed him, he was very convincing. Beverly explained that during her interview with Esquire Magazine, she made the statement about Gleason’s claim to see dead aliens and afterward things between her and Jackie turned sour. “We were on the verge of divorce, but everything was okay until it came out in Esquire,” she said. She informed that Gleason never did deny the story. Regarding her announced intention to write a book, Beverly again said that she abandoned the project due in large part to Gleason’s objection to her comments about him seeing the aliens. I thanked Beverly for talking with me and asked if it would be okay for me to call her back later if I had more questions, she agreed. That concluded our conversation. Special thanks to Donnie Blessing, Grant Cameron and David Rudiak for their help in providing contact information for Beverly Gleason McKittrick. She said that in the years after the Esquire report, other publications picked up the story – some of them she thought, directly from Esquire. Going back to the Gleason/Nixon meetings for golf in Florida, she couldn’t remember any specific date they met but said that her relationship with Jackie Gleason was good during that time frame. She said that she had even met with President Nixon herself, meeting him near a pool and having a drink with him. She said that later, at the time of the Esquire article, her relationship with Jackie was not good. I asked her about the reports she had planned to write a book and whether or not she ever prepared a manuscript. She said that she did not have any written manuscript at any time and nothing otherwise prepared. There is nothing she had ever prepared in writing, she said, to document this first-hand.